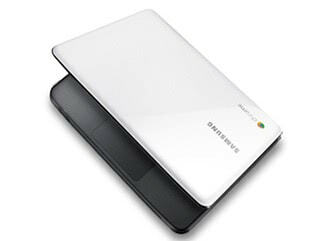 Samsung's new Series 5 Chromebook is one of the very first devices to market running Google's own Chrome OS, a Linux variant cloud-based operating system that is essentially just a web browser and nothing else. I've been testing and living with the Chromebook for a few days now and have already written about my thoughts on the operating system. There are some major, I won't call them failings as that would be unfair, but certainly issues with the operating system around the lack of offline storage and offline apps. There's no native document editing or media playback, and with everything the OS does requiring a live Internet connection to work, there's the fact that the device will be a useless brick when you try to use it offline. 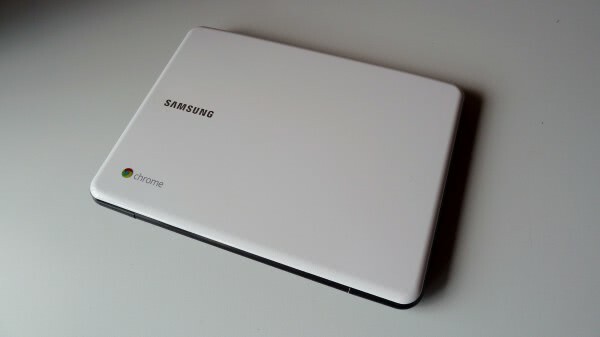 There's still a chance that the Samsung hardware can redeem it though as Chrome OS isn't a bad operating system or indeed a bad idea. It's a very polished OS and very quick; though some people have said not quite as quick as a standard Linux installation and not being able to install Linux on the Series 5 I was unable to test this. The build quality of the Series 5 is superb. The bright white top (it's also available in black) is just lovely and the quality of the plastics used throughout are up to Samsung's usual high standards. It's got a mini VGA port, a USB 2 port and a combined headphone/microphone socket on the left of the body, an SD/MMC card reader on the front and another USB 2 port and, crucially, a USIM slot on the right of the body. This is helpfully behind a flap, though the SD/MMC card reader isn't and so a card will protrude from the machine when inserted, which is a touch disappointing. Internally there's an Intel Atom N570 processor running at 1.66GHz and 2GB RAM. This is backed up by just 16Gb of storage, of which the operating system takes an 'unspecified' amount; remember the Chromebook isn't about offline storage so doesn't provide feedback on how much storage space it has available. The screen is super-bright and generally excellent and the machine will give you a solid 8.5 hours of battery life between recharges, so it will easily keep going for the entire day. The battery is non-removable however as is becoming the trend these days. Last but by no means least there's a 2MP webcam above the screen. Google have specified a new keyboard layout for Chromebooks with the row above the numbers now having keys for back, forward, refresh, switch screen (you can open browser links in new windows and what I dub the earthquake button as it makes the screen shudder when you have only one window open, will otherwise slide between them. Then there are controls for brightness up and down, volume up and down, mute and finally a power button. The caps lock key is now a wide search key, but it's a bit too wide which results in a narrow enter key. This I found disappointing and I'd have hoped for a slightly better keyboard layout. If you press the power button it's debatable whether you actually turn the device off. As it's entirely flash memory-based it's never really off. This makes for a maximum 8 second startup time and from standby you can be working in under three seconds. This really is the definition of "instant on". The machine weighs 1.48kg and is the size of a small netbook. It's also worth noting that the lightweight charger comes equipped with a USB socket for charging your smartphone or other device, a very thoughtful addition. But what is the Series 5 like to live with. Well it's certainly portable though perhaps not as light as you might hope for such a 'lightweight' machine, which will be down to the excellent battery and screen. You can merrily use the Series 5 out and about thanks to the USIM slot and with my 3G data SIM installed it connected quickly and seamlessly to my provider and a provided a broadband-speed connection. You can enable and disable both the wireless and mobile data connections in the software to maximize battery life and make certain you're not wasting your valuable paid-for data when wi-fi is available. So I can dispel one myth straight away. On the evening of getting the Series 5 delivered I took it down the pub and was using it happily. This machine is anything but a brick when away from wi-fi, this is excellent news though you'll want a good data package to go with it. This means that if you want a Series 5 or another Chromebook it would be worth finding a good deal with a mobile phone operator. It's nice to see a multi-touch trackpad too and indeed this is one of the most friendly things about the Series 5 as it's both large and extremely usable. Indeed the keyboard quality, despite the narrow enter key deserves a mention for being very easy to type on with large keys and easy to read letters on the keys. This brings me on to the types of people who might benefit most from having a Chromebook. These people being children who might benefit from having something at school that will help them access Google Docs, as this is commonly used by schools now, and pensioners who will benefit from the simplicity of the OS, the great keyboard and bright screen. On this note though, Google will have to do some work to enable the partially sighted to scale the whole OS and not just the contents of the browser window. Google are updating Chrome OS regularly though and even my issues with offline apps is being addressed with a forthcoming offline version of Google Docs. Who knows what will happen with a media player and other apps in the future. So what what do I think of it and can I recommend the Series 5? The machine is $430 (£350) or $500 for the 3G version which is the price of a high-end netbook with a 320Gb hard disk. 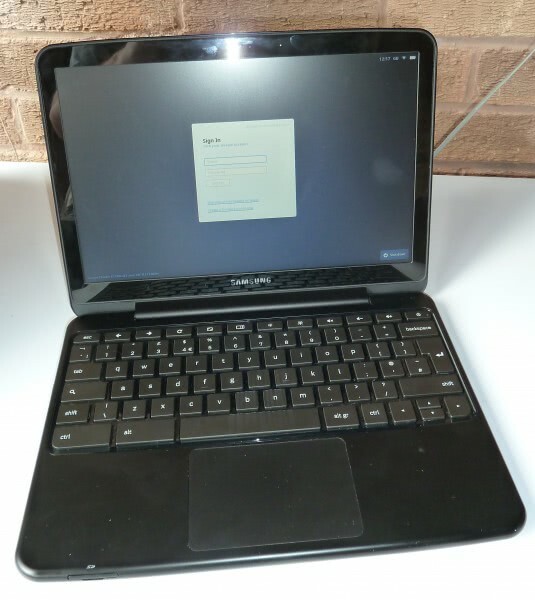 So would you want to buy a Chromebook rather than a netbook onto which you can install Google's Chromium OS, the downloadable alternative to Chrome OS? To be honest, at this point I'd rather recommend a good netbook instead, but Chrome OS is a great operating system and they're addressing all the shortcomings one by one. To top this off with the Series 5 being such a quality product, if you're not a big user of files and music (perhaps you use your phone for music) then the Series 5 can be recommended. Certainly if you're looking for a sturdy portable device for the kids going back to school next month coupled with the dependability of Linux, you can't go far wrong with the Series 5 Chromebook, just make sure you buy the 3G one. You can buy the Samsung Series 5 Chromebook at Amazon: There are currently four models available, two Wi-Fi models and two 3G models in the colors Titan Silver or Arctic White. I can tell you that Not only I love it, but also enjoy the utter Freedom from Microsoft. That Is one thing that you never will know as long you are under Microsoft control.